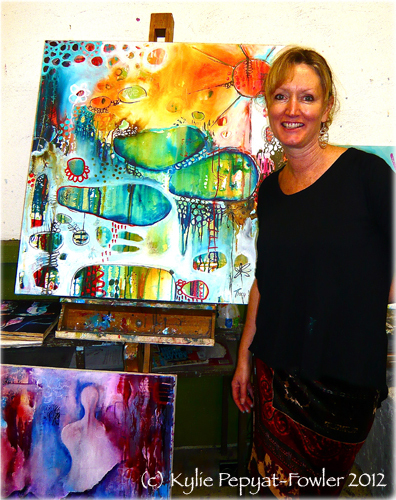 Last weekend I was lucky enough to attend an art workshop ‘Paint Mojo’ by the wonderful and talented Tracy Verdugo. The equally lovely Liza Zeni and Wini Dougall hosted the event at Gasworks Art Park in Port Melbourne. 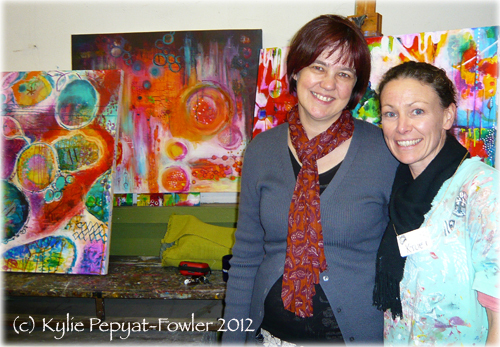 I met some wonderful artists on the day, including Anna Bartlett from Shiny Happy Art and Melissa Millar from Artified. Thank you to all the lovely ladies I met. You are are fabulous bunch of creative women and I had a terrific time. Thank you Louise Nicdao for your great company. Well done Tracy, Liza and Wini for a successful workshop. I have to make a special mention about the yummiest cake and cup cakes I have ever tasted…….not kidding. The very talented Liza Zeni made them as well as the cute illustrated name tags we all wore. My small painting from the weekend. Not finished though. To view more photos feel free to visit my Facebook page. 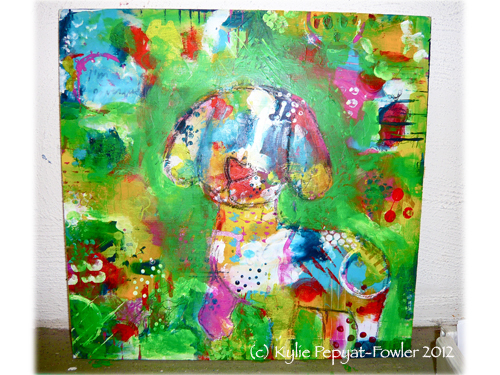 Tracy has more Paint Mojo Workshops coming up so do yourself a favor and go visit her blog for more details. You’ll love it. 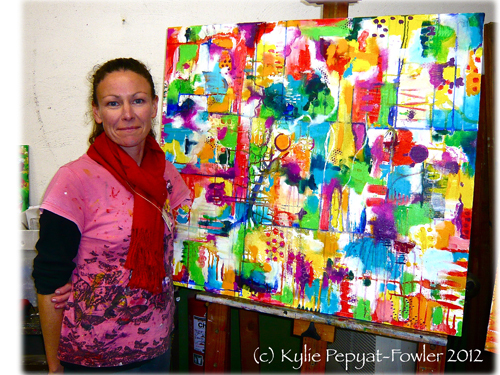 Hi Kylie – lovely post about a lovely weekend! I'm just working on mine now (I know, I've been busy). Was wondering if I could borrow your pic of Tracy and her finished painting? Yours is nicer than mine and I'll be linking to you anyway – I think 'my people' would like you a lot! LOVE the painting you created! so fun you had the chance to paint with Tracy! Great post Kylie! 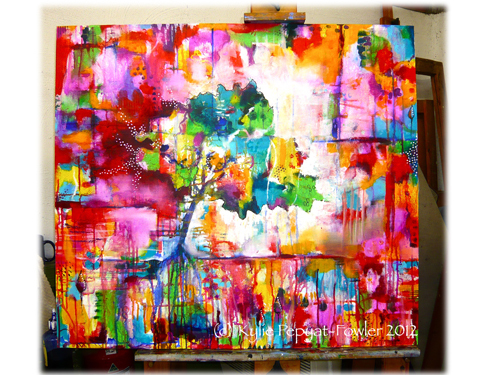 Your painting is amazing, so full of life and colour! I'm so glad to hear that you had a terrific time. It was lovely to meet you. I apologise for taking so long to comment. I was sure that I left a message for you, because I visited and linked to your post a few months ago, but it looks like I didn't leave one. Anyway wishing you the best of luck on your painting journey!